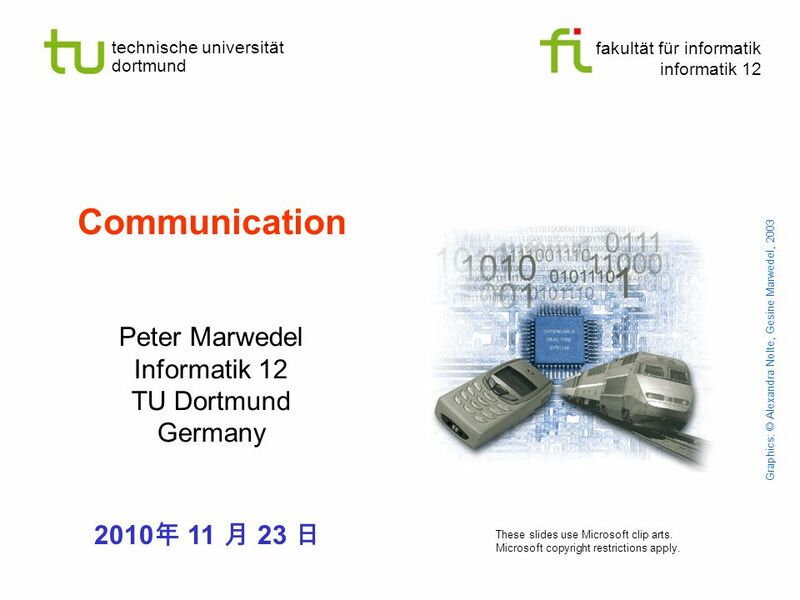 1 fakultät für informatik informatik 12 technische universität dortmund Communication Peter Marwedel Informatik 12 TU Dortmund Germany 2010 年 11 月 23 日 Graphics: © Alexandra Nolte, Gesine Marwedel, 2003 These slides use Microsoft clip arts. 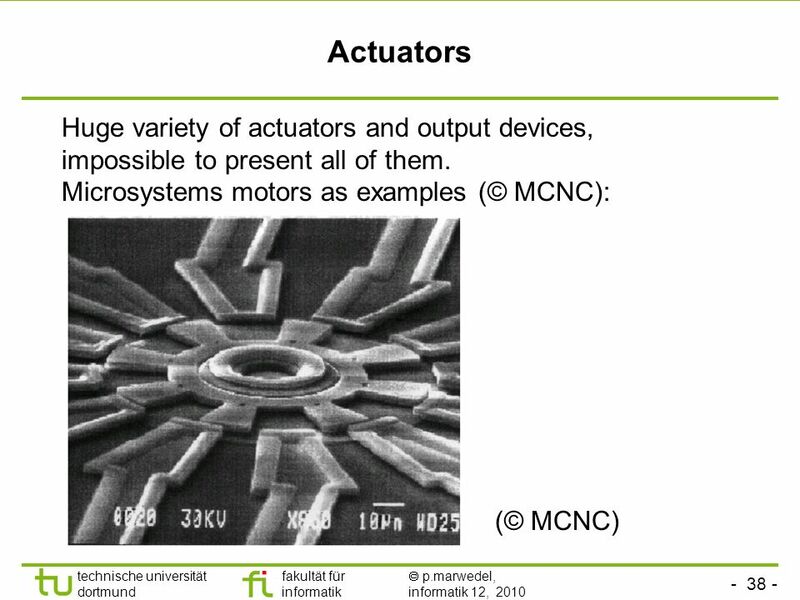 Microsoft copyright restrictions apply. 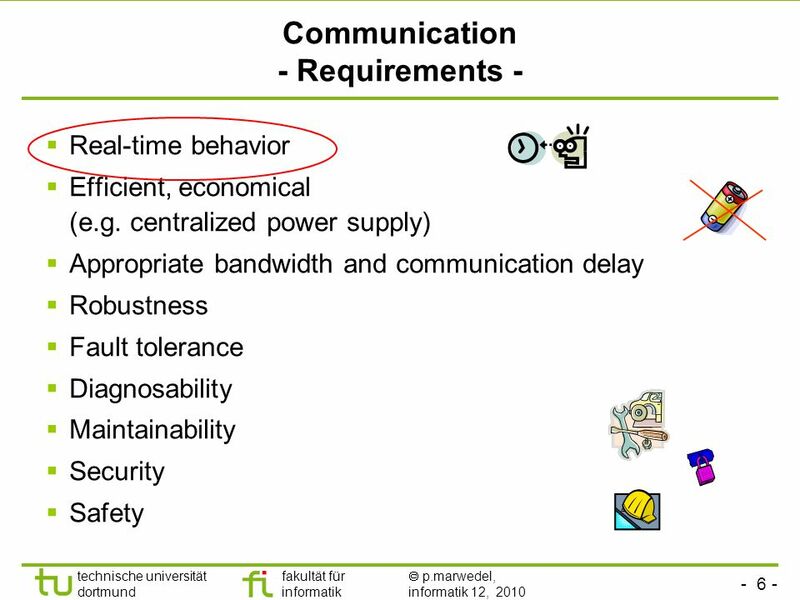 8 - 8 - technische universität dortmund fakultät für informatik  p.marwedel, informatik 12, 2010 Real-time behavior Carrier-sense multiple-access/collision-detection (CSMA/CD, Standard Ethernet) no guaranteed response time. 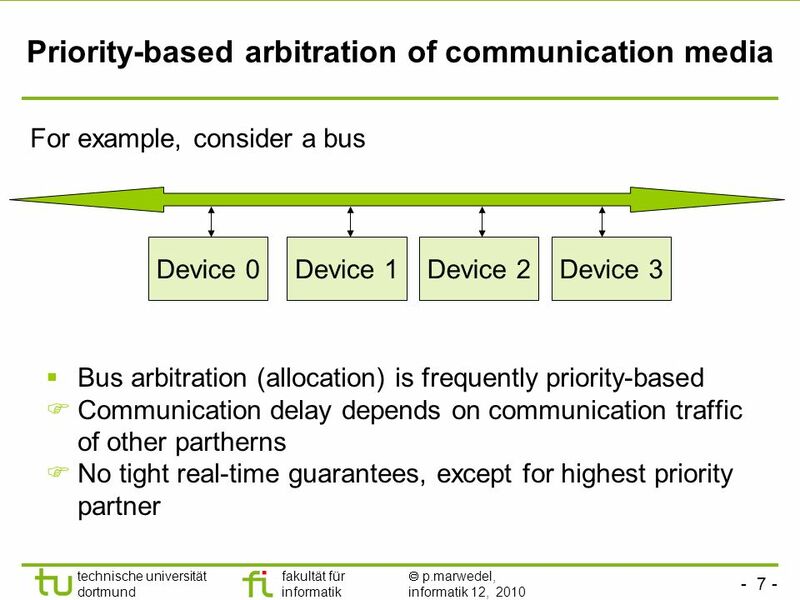 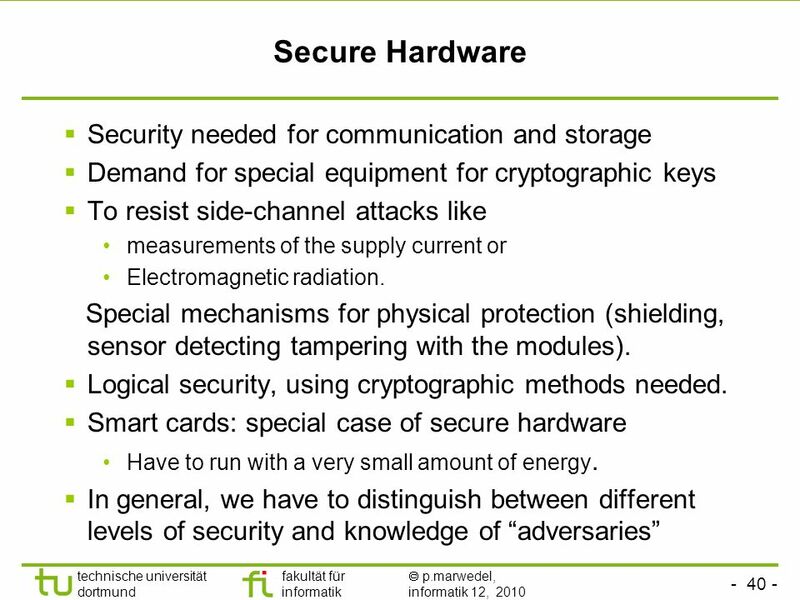 Alternatives:  token rings, token busses  Carrier-sense multiple-access/collision-avoidance (CSMA/CA) WLAN techniques with request preceding transmission Each partner gets an ID (priority). 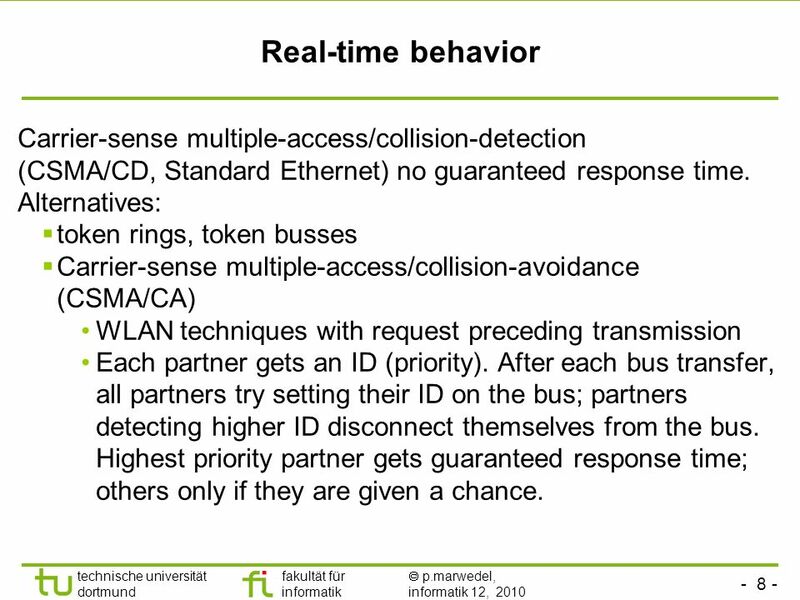 After each bus transfer, all partners try setting their ID on the bus; partners detecting higher ID disconnect themselves from the bus. 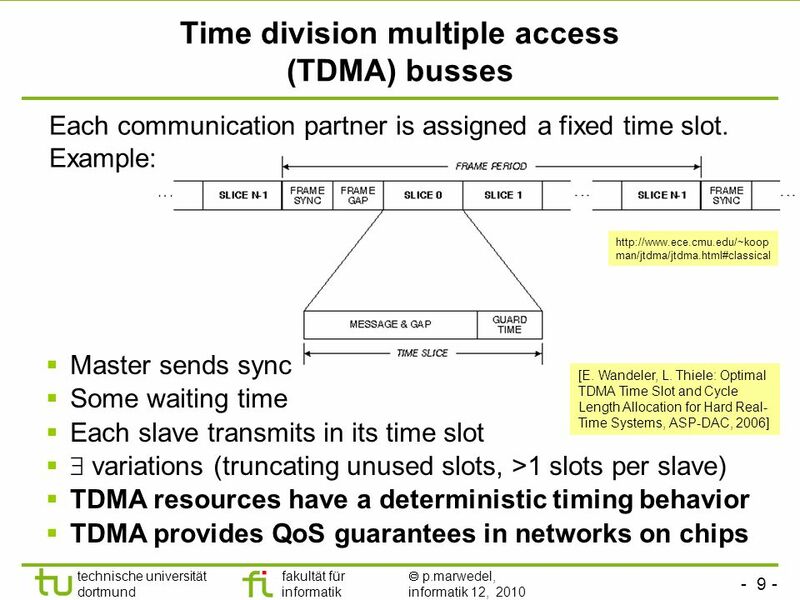 Highest priority partner gets guaranteed response time; others only if they are given a chance. 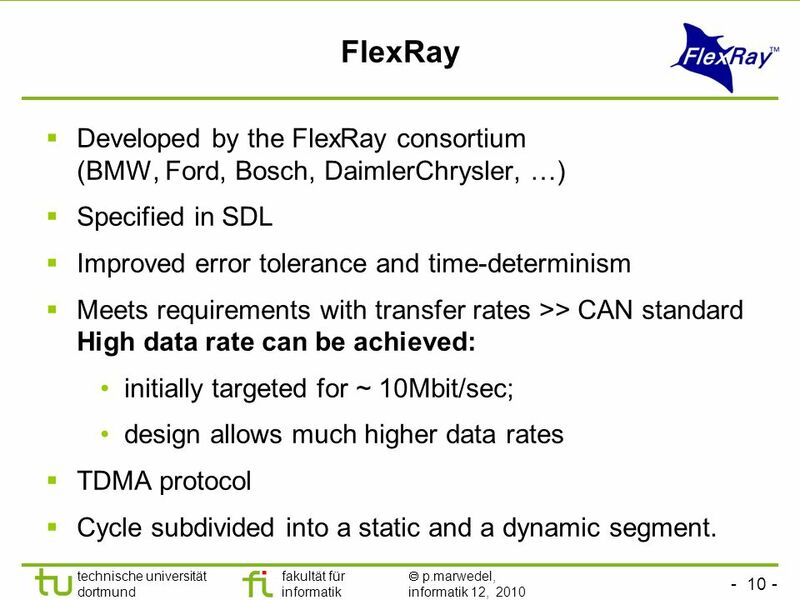 10 - 10 - technische universität dortmund fakultät für informatik  p.marwedel, informatik 12, 2010 FlexRay  Developed by the FlexRay consortium (BMW, Ford, Bosch, DaimlerChrysler, …)  Specified in SDL  Improved error tolerance and time-determinism  Meets requirements with transfer rates >> CAN standard High data rate can be achieved: initially targeted for ~ 10Mbit/sec; design allows much higher data rates  TDMA protocol  Cycle subdivided into a static and a dynamic segment. 15 - 15 - technische universität dortmund fakultät für informatik  p.marwedel, informatik 12, 2010 Other busses  Sensor/actuator busses: connecting sensors/actuators, low rates  Field busses  CAN: Controller bus for automotive  LIN: low cost bus for interfacing sensors/actuators in the automotive domain  MOST: Multimedia bus for the automotive domain (not a field bus)  MAP: bus designed for car factories. 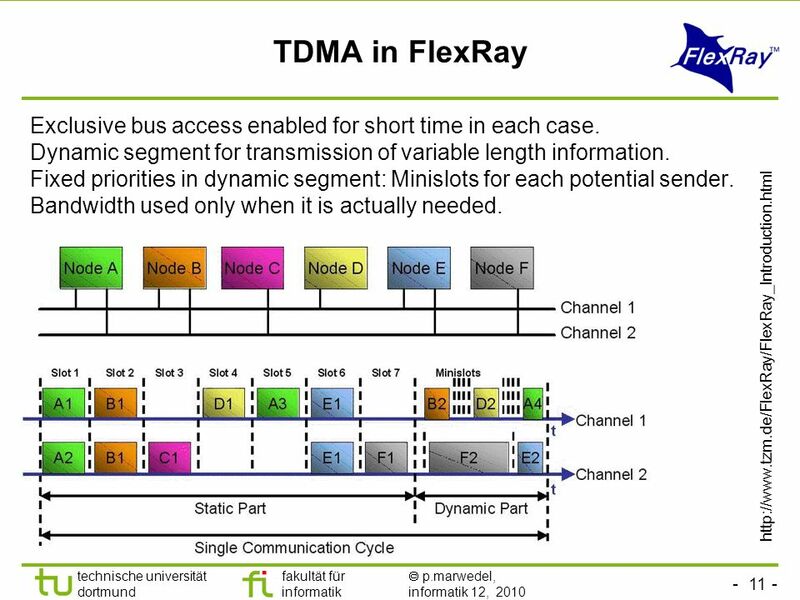 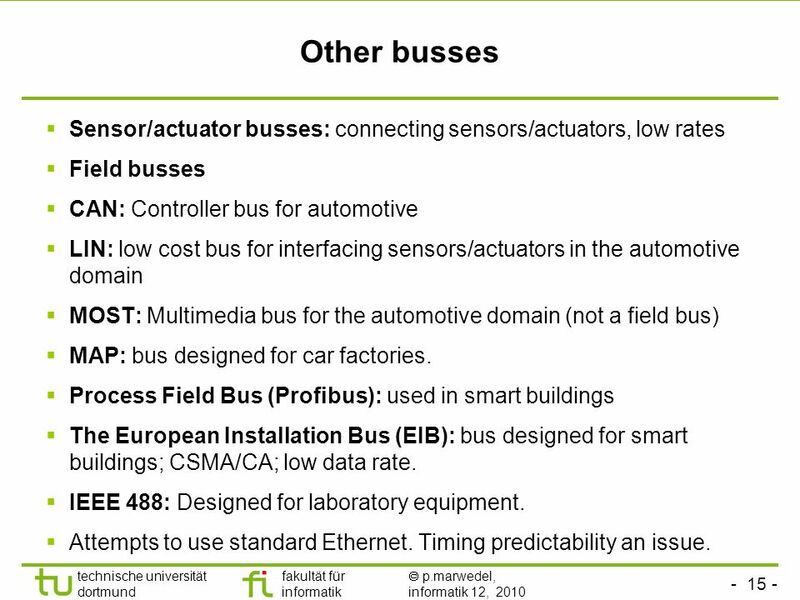  Process Field Bus (Profibus): used in smart buildings  The European Installation Bus (EIB): bus designed for smart buildings; CSMA/CA; low data rate.  IEEE 488: Designed for laboratory equipment. 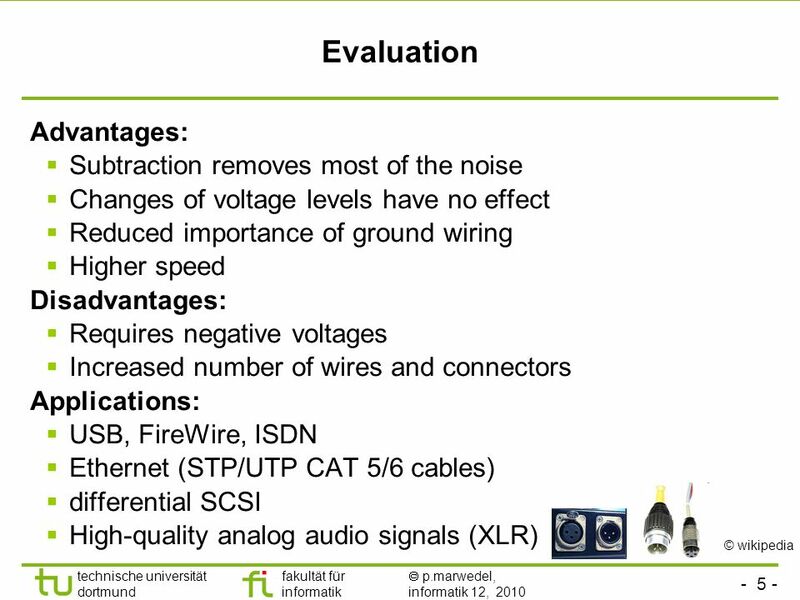  Attempts to use standard Ethernet. 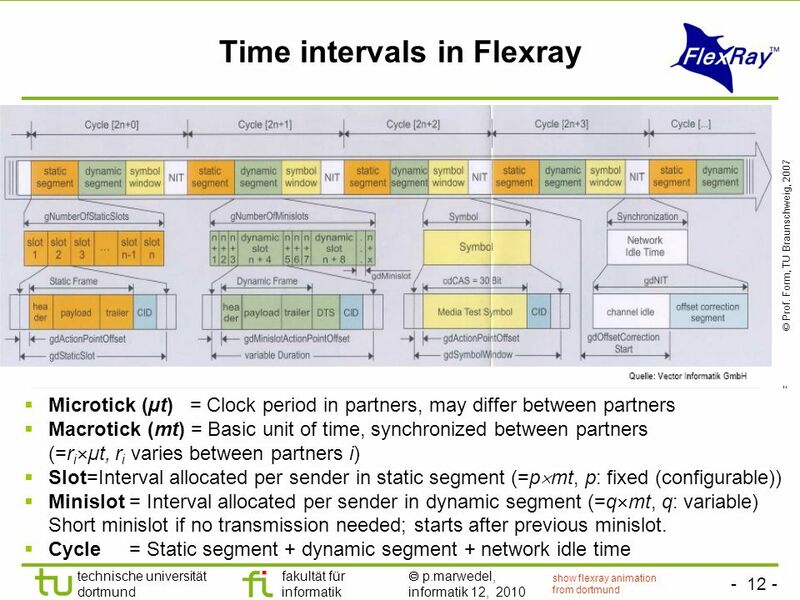 Timing predictability an issue. 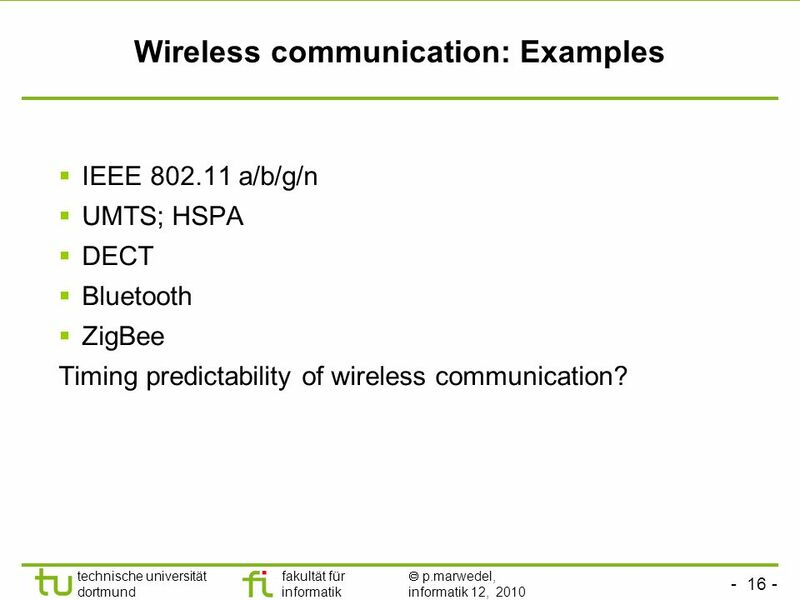 16 - 16 - technische universität dortmund fakultät für informatik  p.marwedel, informatik 12, 2010 Wireless communication: Examples  IEEE 802.11 a/b/g/n  UMTS; HSPA  DECT  Bluetooth  ZigBee Timing predictability of wireless communication? 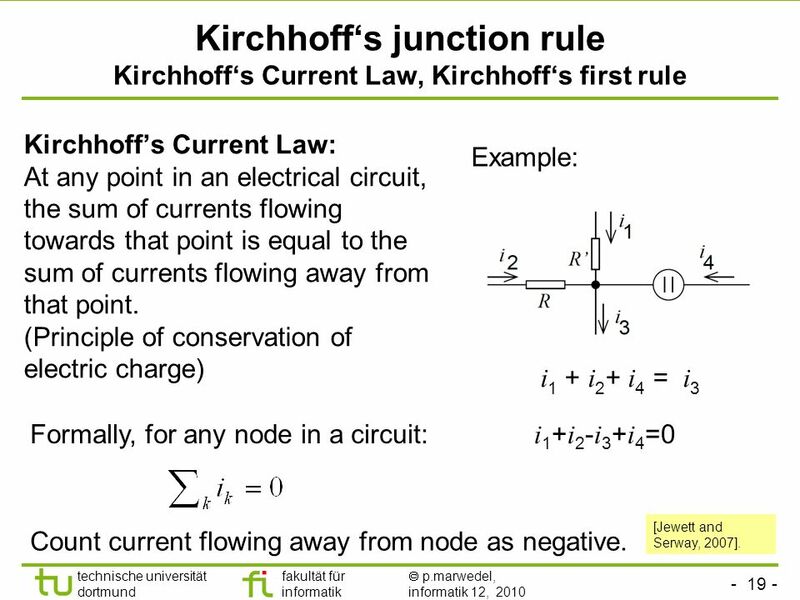 19 - 19 - technische universität dortmund fakultät für informatik  p.marwedel, informatik 12, 2010 Kirchhoff‘s junction rule Kirchhoff‘s Current Law, Kirchhoff‘s first rule Kirchhoff’s Current Law: At any point in an electrical circuit, the sum of currents flowing towards that point is equal to the sum of currents flowing away from that point. 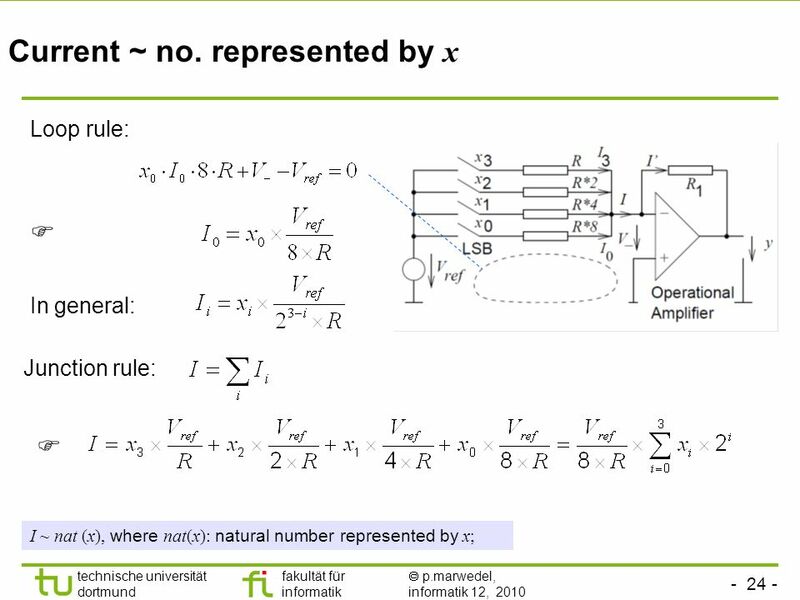 (Principle of conservation of electric charge) i 1 + i 2 + i 4 = i 3 Formally, for any node in a circuit: Example: i 1 + i 2 - i 3 + i 4 =0 Count current flowing away from node as negative. 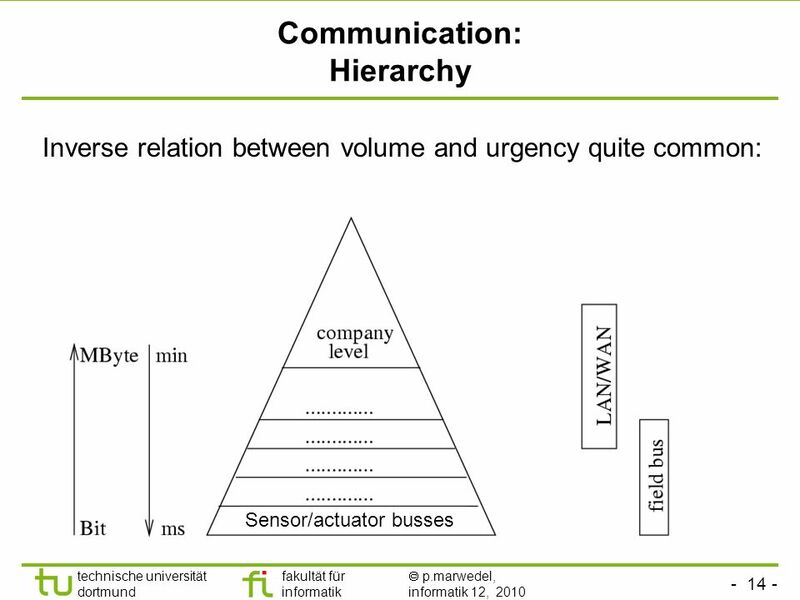 [Jewett and Serway, 2007]. 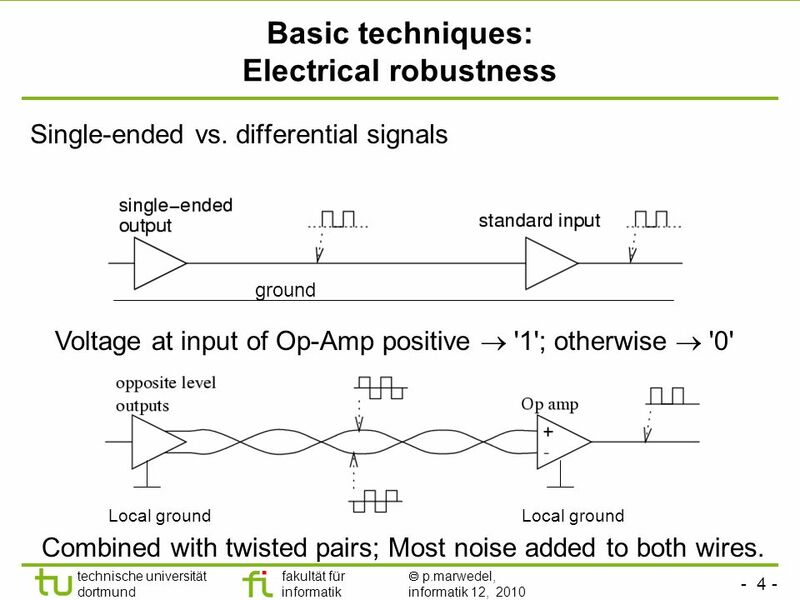 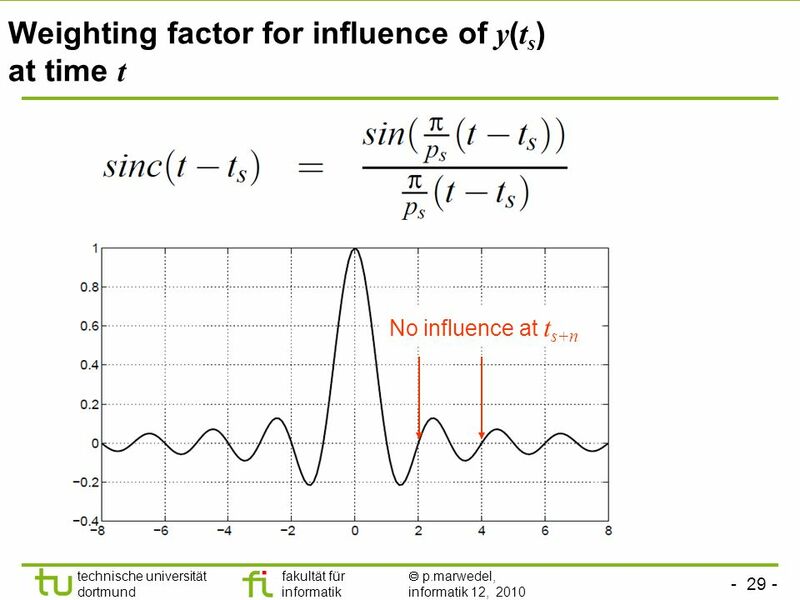 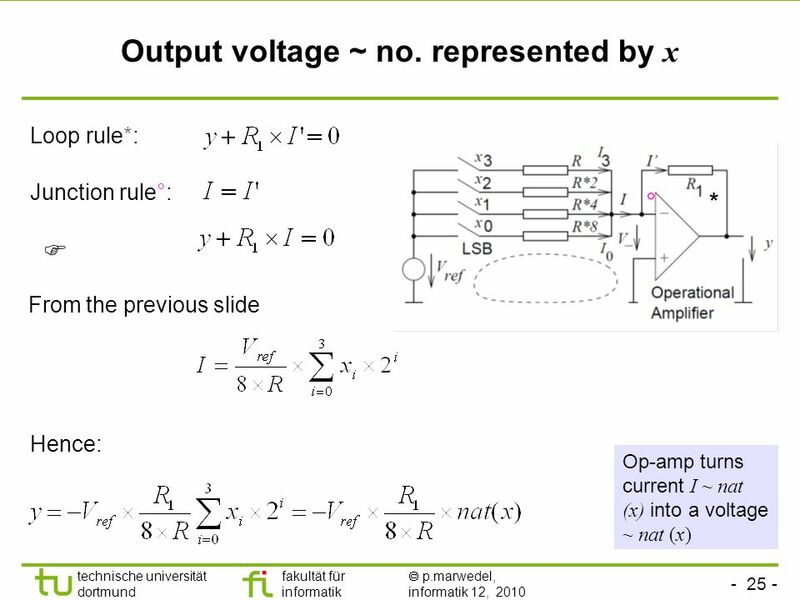 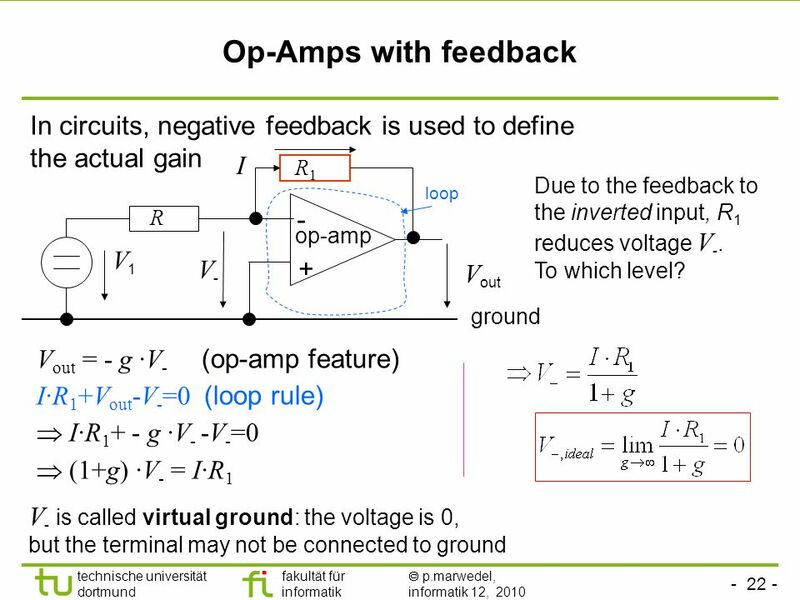 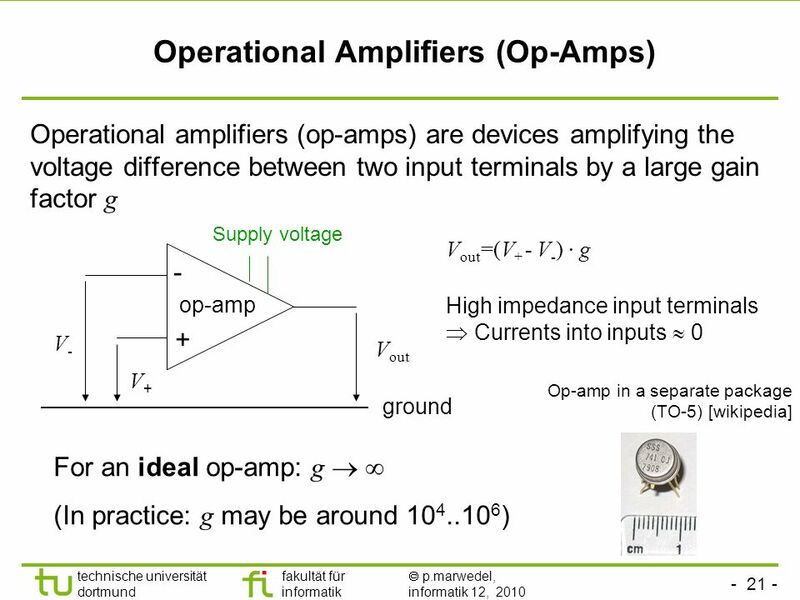 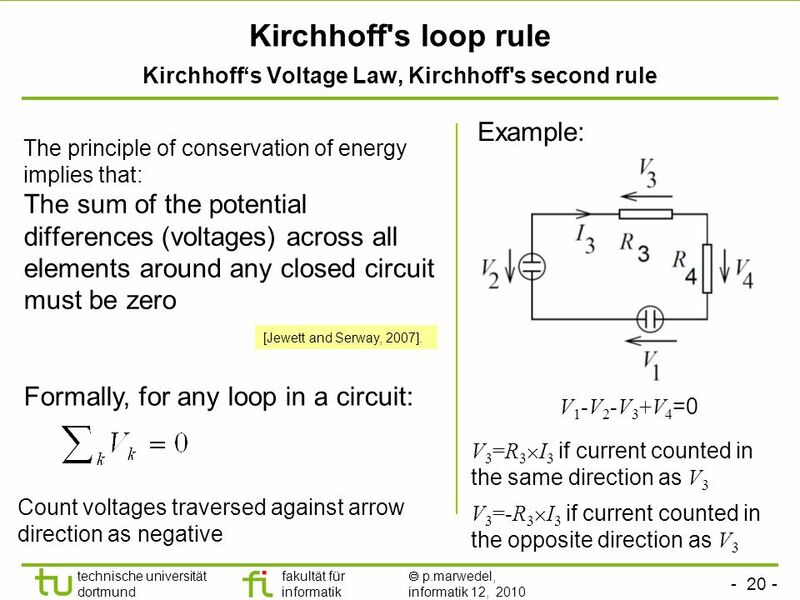 20 - 20 - technische universität dortmund fakultät für informatik  p.marwedel, informatik 12, 2010 Kirchhoff's loop rule Kirchhoff‘s Voltage Law, Kirchhoff's second rule The principle of conservation of energy implies that: The sum of the potential differences (voltages) across all elements around any closed circuit must be zero Example: Formally, for any loop in a circuit: Count voltages traversed against arrow direction as negative V 1 -V 2 -V 3 +V 4 =0 V 3 =R 3  I 3 if current counted in the same direction as V 3 V 3 =-R 3  I 3 if current counted in the opposite direction as V 3 [Jewett and Serway, 2007]. 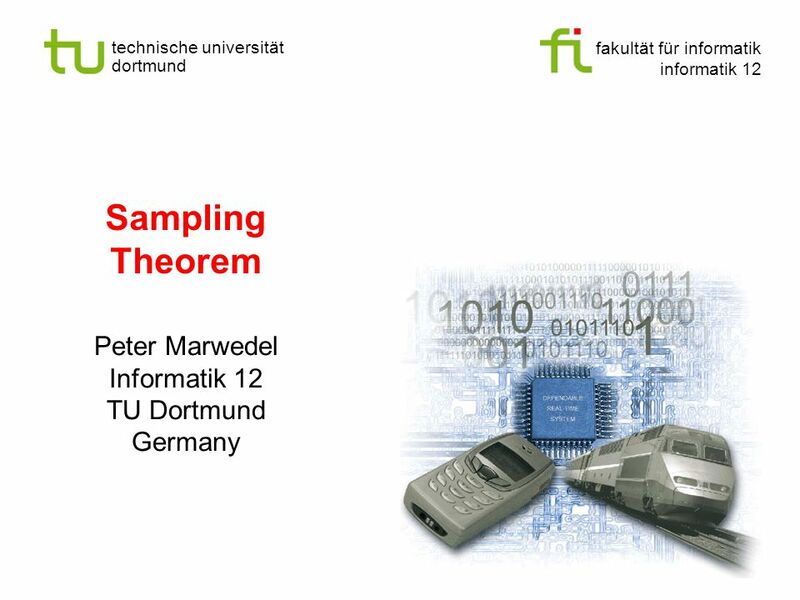 33 - 33 - technische universität dortmund fakultät für informatik  p.marwedel, informatik 12, 2010 How precisely are we reconstructing the input? 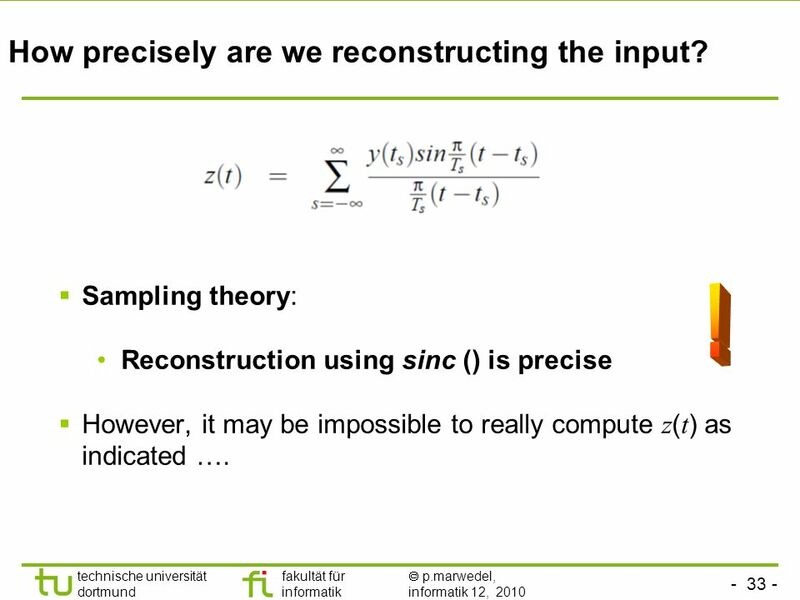  Sampling theory: Reconstruction using sinc () is precise  However, it may be impossible to really compute z ( t ) as indicated …. 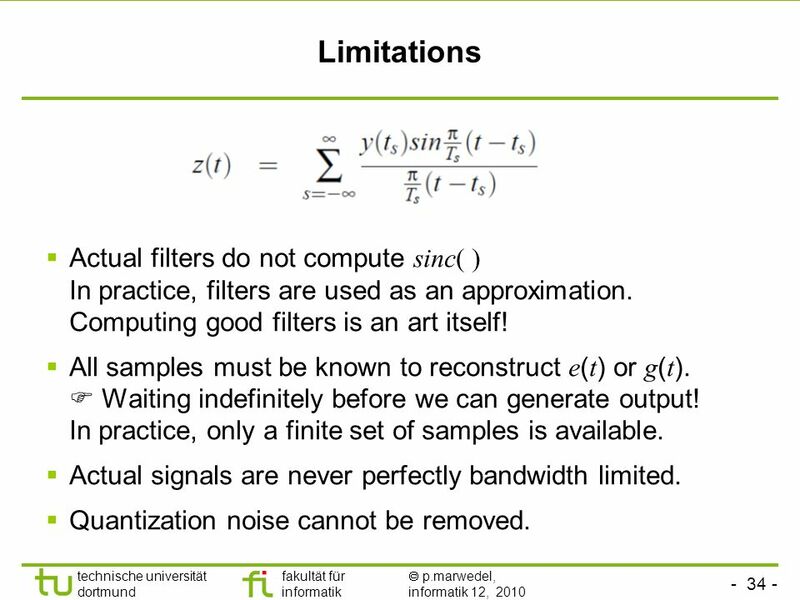 34 - 34 - technische universität dortmund fakultät für informatik  p.marwedel, informatik 12, 2010 Limitations  Actual filters do not compute sinc( ) In practice, filters are used as an approximation. 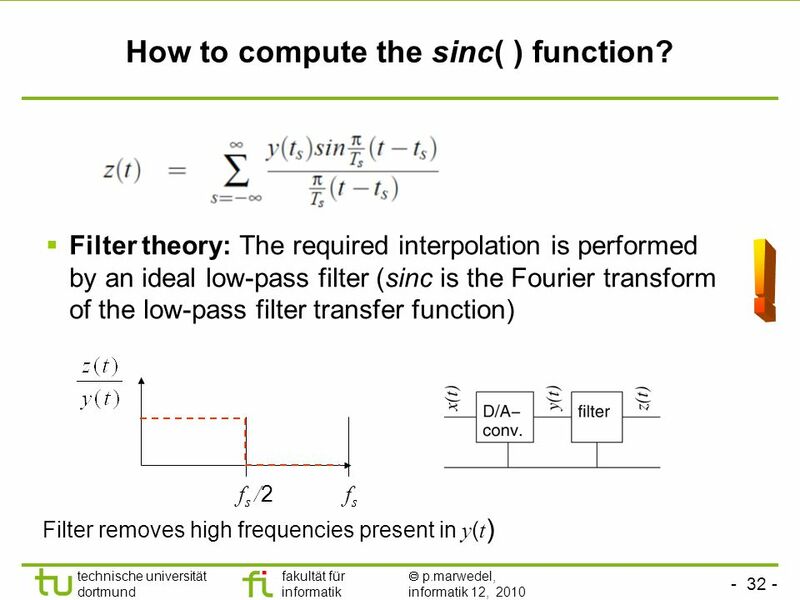 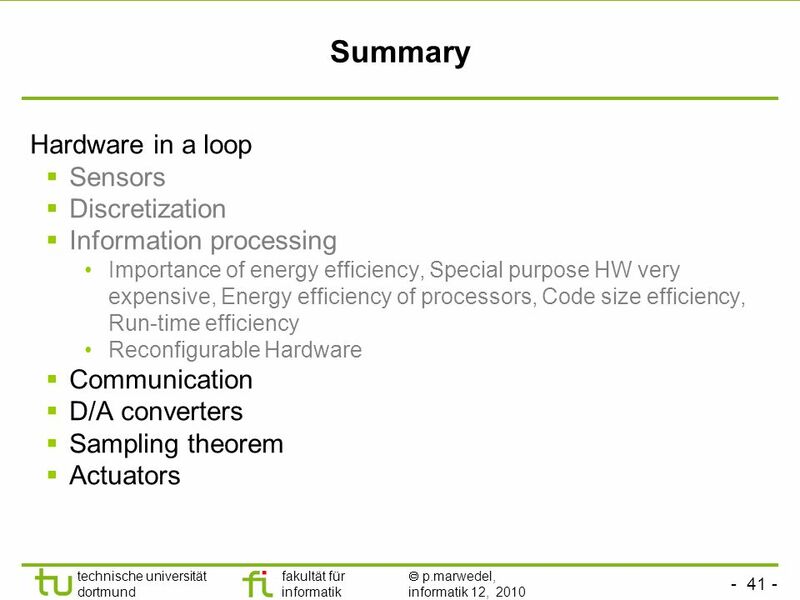 Computing good filters is an art itself! 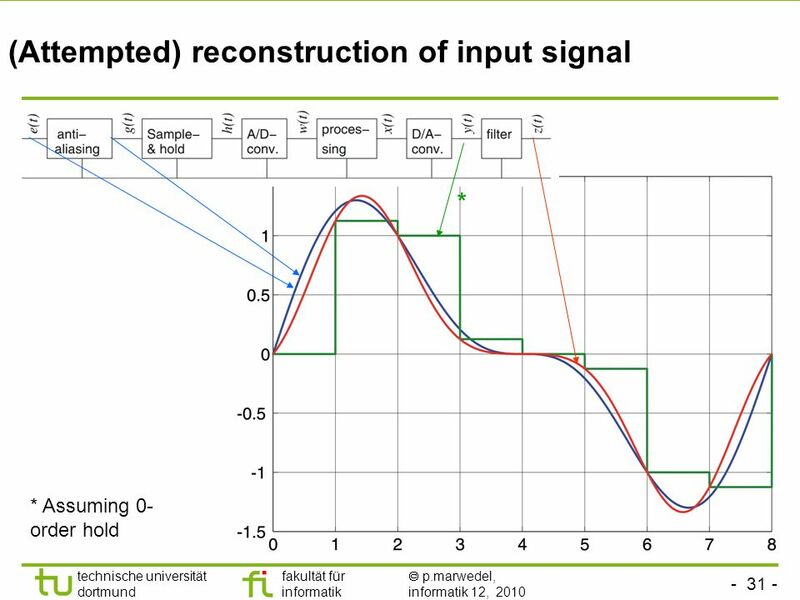  All samples must be known to reconstruct e ( t ) or g ( t ). 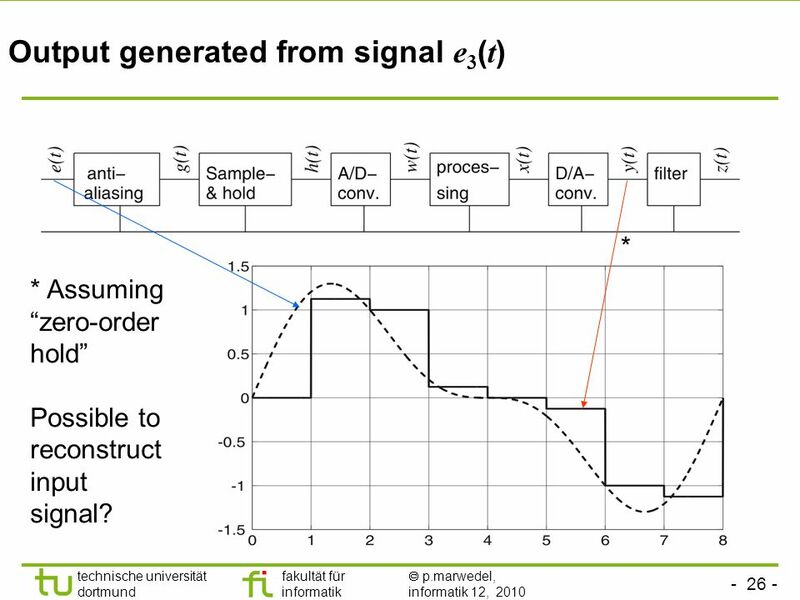  Waiting indefinitely before we can generate output! 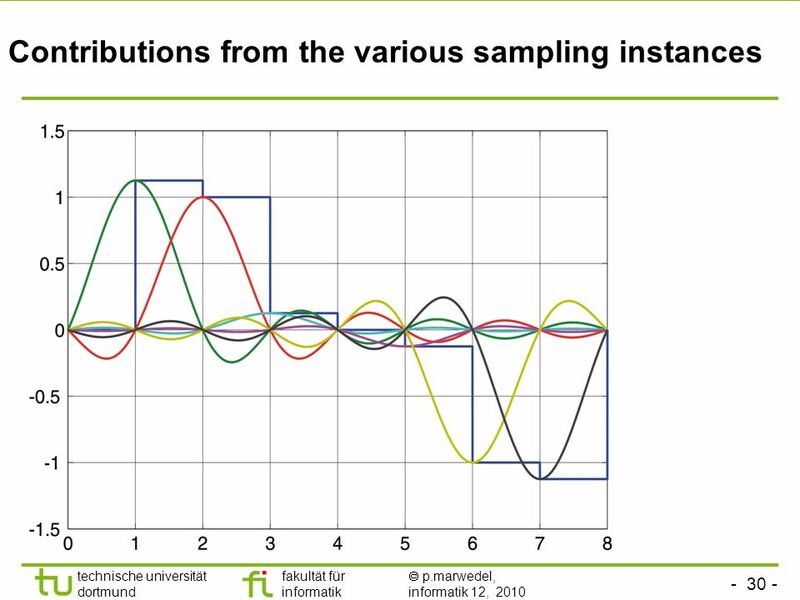 In practice, only a finite set of samples is available.  Actual signals are never perfectly bandwidth limited. 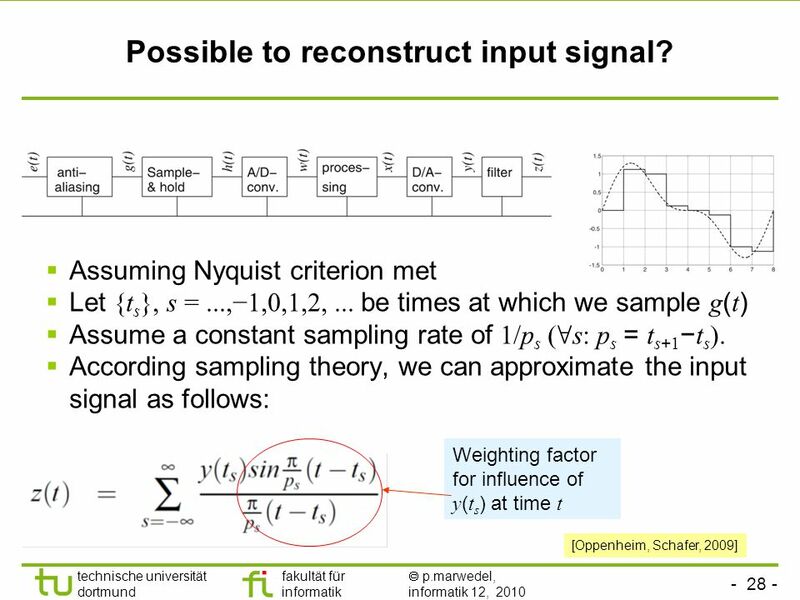  Quantization noise cannot be removed. 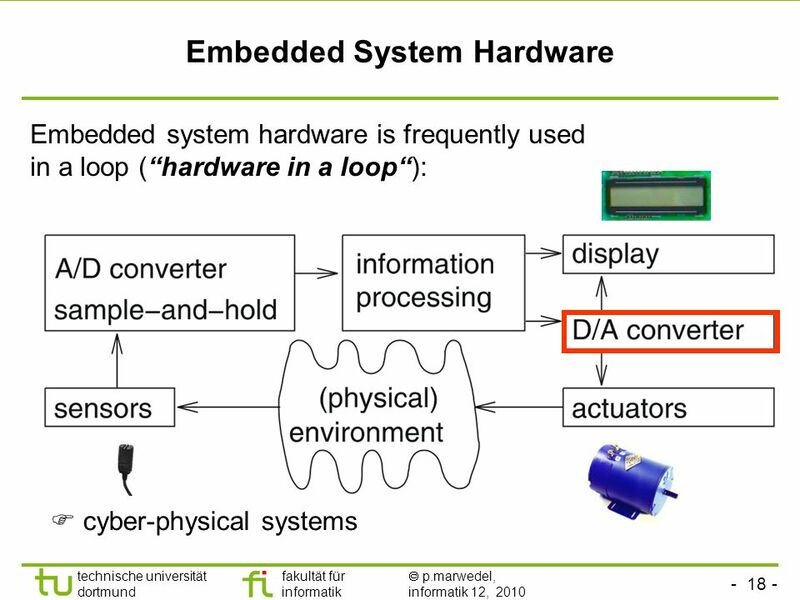 35 - 35 - technische universität dortmund fakultät für informatik  p.marwedel, informatik 12, 2010 Output Output devices of embedded systems include  Displays: Display technology is extremely important. 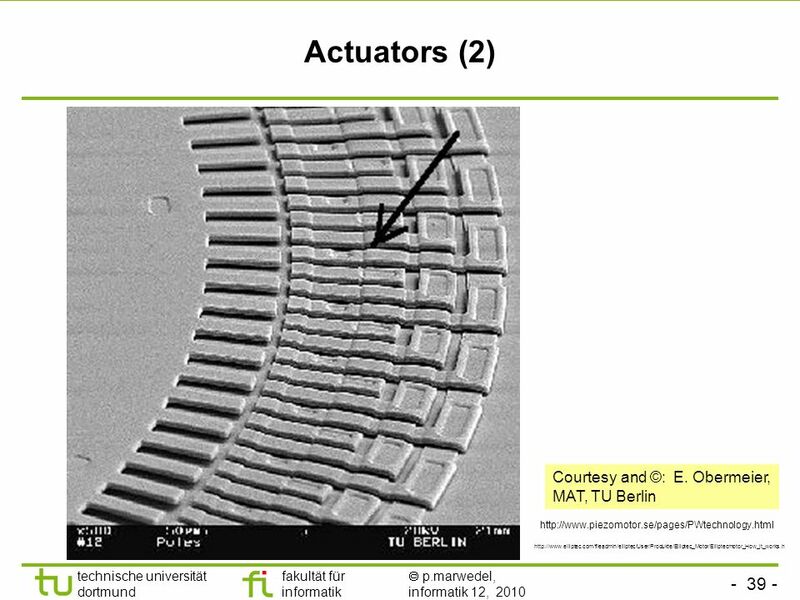 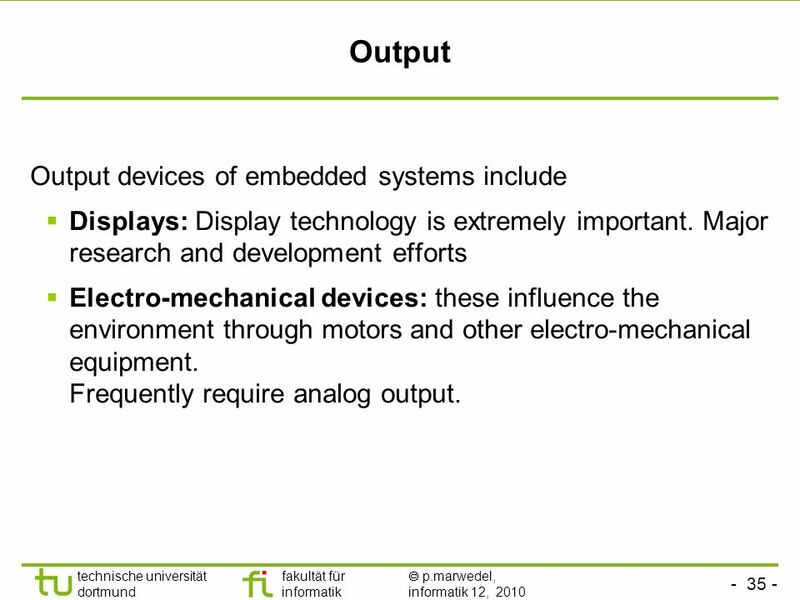 Major research and development efforts  Electro-mechanical devices: these influence the environment through motors and other electro-mechanical equipment. 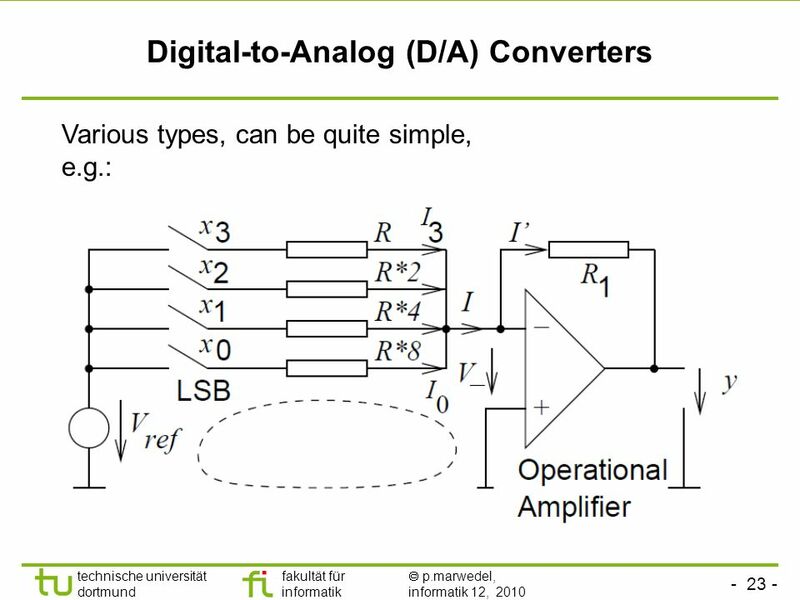 Frequently require analog output. 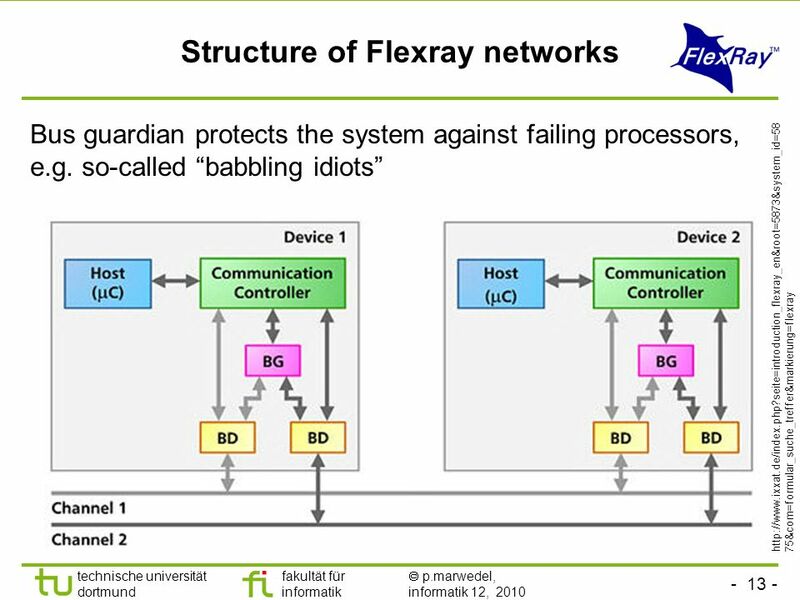 Herunterladen ppt "Fakultät für informatik informatik 12 technische universität dortmund Communication Peter Marwedel Informatik 12 TU Dortmund Germany 2010 年 11 月 23 日 Graphics:"
Fakultät für informatik informatik 12 technische universität dortmund Mapping of Applications to Platforms Peter Marwedel TU Dortmund, Informatik 12 Germany.